We have all seen them. 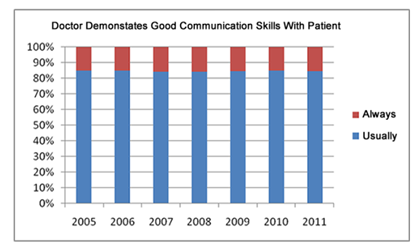 You know…those charts showing us how satisfied patients are with the way their doctors communicate. Did your doctor listen to you? Did you doctor explain things in a way you could understand? Funny thing about these charts, whether they be for hospitals or doctors' offices, 1) they never seem to change from year to year – 80%-90% of doctors communicate well with patients, and 2) patients consistently rate their doctors’ communication skills as high. 68% to 85.3% of patients could not name the physician in charge of their care. 43% to 58% of patients did not know the reason for their hospital admission. 67% of patients received a new medication while hospitalized, yet 25% of these patients were unaware that they were given a new medication. 90% of patients given a new medication reported never being told of adverse effects of the new medication. 38% of patients were not aware of planned tests for the day. The amazing thing was that a majority of these patients (up to 58% in one study) said that their doctors always explained things in ways they could understand! Patients are interrupted by their physicians within the first 18 seconds of their opening statement during office visits. Physicians and patients agree on the reason for the office visit only 50% to 70% of the time. Physicians underestimate the patient’s desire for health information 65% of the time. 50% of patients walk out of their doctor’s office not understanding what their doctor told them to do. Patients are not asked if they have any questions in up to 50% of office visits. Again, I am sure these same patients praised their physicians’ communication skills on one or another satisfaction survey. So what explains the “disconnect” between how physicians actually talk to patients and patient satisfaction? Today’s high patient satisfaction scores are an artifact of the way we (when we become patients) have been “socialized” when it comes to a trip to the doctor’s office. Here’s what I mean. Beginning with childhood, we have all been socialized to assume the “sick role” when seeing the doctor. From our initial visits to the pediatrician with our mom, we quickly learned that the doctor is in charge and that our Mom’s role (and ours) is to sit passively by while the doctor does most of the talking. Notwithstanding all the “talk” about how empowered patients are today, most of us still assume the “sick role” when seeing our doctor. Accustomed as most of us today are to the sick role, and accepting the fact that physicians are very busy, we are not surprised when doctors don’t seem to listen to us or interrupt us. We are not surprised that they don’t have time for all our questions or frown on us bringing in lists of things we have researched on the internet. This, for most patients, is what we are used to…it is what we are satisfied with given that most of us have don’t another or better point of comparison, i.e., a highly patient-centered physician. Consistent with the sick role, we as patients “tend to be overly patient.” We “grant our doctors the benefit of every doubt.” Most of us begrudgingly put up with poor service, inconvenience, and unnecessary discomforts until we can’t overlook it anymore. Even then we are reluctant to take our busy, overburdened doctor to task for these shortcomings by giving them a low score on a satisfaction survey. Be cautious about putting too much credence in patient ratings of physician communication skills. “One can assume that the quality of care is actually worse than surveys of patient satisfaction would seem to show”—to quote Avedis Donabedian, MD, an old professor of mine. Recognize that high quality, patient-centered communications (the gold standard for physician-patient communications) is essential to patient engagement, optimal patient outcomes and great patient experiences. If physician communication were as great as patients satisfaction surveys suggest, we wouldn’t be having the problems we are with low levels of patient engagement and non-adherence. Benchmark the patient centered communication skills of the primary care physicians on their staff (employed and otherwise) and compare the findings against established best practices. Take the additional reimbursement you will get from CMS for your patient high satisfaction scores and invest it back into improving the patient-centered communication skills of their physicians and patients. That is, if you don’t have to pay a penalty to CMS for high re-admission rates – which by the way is another by-product of poor physician-patient communication. Remember that there is perhaps no better, more cost-effective way to differentiate your physicians (and your brand) these days than to have physicians on staff who really know how to listen and relate to patients. Boland, B. et al. Patient-Physician Agreement on Reasons for Ambulatory General Medical Examinations. Mayo Clinic Proceedings, 1998;73(1), 109-117. O’Leary, K. et al. Hospitalized Patients’ Understanding of Their Plan of Care. Mayo Clinic Proceedings 2010;85(1):47-52. This post was originally published on Steve Wilkins' blog, Mind The Gap, on February 5, 2013. Guest Blogger Stephen Wilkins, MPH, is a former hospital executive, consumer health behavior research and recent care giver. He has witnessed incredible oversights and gaps in physician-patient communications that have had “near catastrophic” consequences for patients like his wife who was diagnosed with Stage 4 Lung Cancer in 2004. He is the co-founder of Health Messaging Inc., which focuses on developing ideas and solutions for improving the quality of communications between physicians and patients. He blogs on Mind The Gap, where this post originally appeared, and you can follow him on twitter at @Healthmessaging. My Doctor Gets 3 Stars? 2 Thumbs Up? B+? Are Patient Ratings a Good Guide to a Good Hospital?